Sony unveils new soundbars and HT-XT1 soundbase | What Hi-Fi? The HT-CT770 and HT-CT370 soundbars are just 5cm tall and include wireless subwoofers. The HT-XT1 soundbase will allow TVs of up to 30kg in weight sit on top. 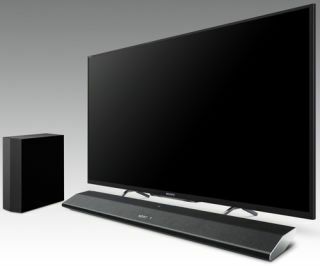 Sony has announced the imminent release of two new soundbars (HT-CT770 and HT-CT370) and its first soundbase (HT-XT1). The products incorporate Sony's new ClearAudio+ technology, which works out whether you're watching a film, a TV programme or gaming and adjusts the EQ. Dolby TrueHD and DTS-HD are both supported across the range, while all devices are Bluetooth and near-field communication equipped (NFC). NFC will allow users to connect their smartphone or mobile by touching it against the soundbar to stream audio. Sony's new SongPal app will allow users to control ClearAudio+, the subwoofer and other sound settings on an Apple or Android device. The HT-CT370 soundbar (pictured, top) features 2.1-channel audio, thanks to its two 60mm driver units, and has a wireless, front-firing compact subwoofer, delivering 300W of output. Meanwhile, the HT-CT770 has additional speakers and a larger, down-firing subwoofer to deliver 330W of output. At just 5cm high, the soundbars can comfortably sit in front of most TVs without blocking the IR receiver or they can be wall mounted. Both soundbars sit at a 25-degree angle, which Sony claims offers better sound dispersion. Both soundbars feature three HDMI inputs, plus one optical and one 3.5mm input, plus one HDMI output. The HT-CT370 and HT-CT770 soundbars are expected to launch later this month, priced £350 and £450 respectively. The Sony HT-XT1 soundbase has been designed to hold TVs weighing up to 30kg and the company has designed it with its 2014 TV range in mind, so it's capable of taking TVs ranging from 32in to 50in. Like the soundbars, it also has three HDMI inputs, one HDMI output and optical and 3.5mm inputs. The HT-XT1 features a floating top, which Sony claims minimises vibration caused by the two subwoofer drives on the bottom of the soundbase. The Sony HT-XT1 soundbase has an imminent release date and is priced £350.